There are several reasons why you may want to consider the use of a preemergence residual herbicide in soybeans. First, residual herbicides may be a good option for you simply from an "insurance" or yield protection standpoint. Often, a properly timed early postemergence glyphosate application to weeds that are 4- to 6-inches tall turns into an application where the weeds have reached 12-inches tall or more and the soybeans are barely noticeable. Without fail, I see this in some Missouri fields each year. Regardless of the reason, when this type of situation occurs some yield has already been lost. To see the effects of increasing weed sizes and weed competition on soybean yield loss for yourself, go to http://www.weedsoft.org and use the WeedSOFT yield loss calculator. This is a tool developed by a number of university weed scientists that enables you to estimate the season-long yield loss, as well as the yield loss that has already occurred, for soybeans that are at a particular stage of growth and infested with a specific density and population of weeds. It will also estimate the additional yield loss that may occur if you delay treatment further. Another reason you should consider the use of a residual herbicide in soybeans is due to the increasing number of glyphosate-resistant weeds that are being identified in Missouri each year. As I have documented in many previous newsletter articles and presentations (http://weedscience. missouri.edu/extension/2009Survey/2009Survey.html), a high percentage of soybean acres in Missouri are now infested with glyphosate-resistant waterhemp. More recently, we have also identified several populations of glyphosate-resistant giant ragweed around the state. Almost exclusively, these weeds have been discovered in continuous Roundup Ready cropping systems where glyphosate has been used as one of the only herbicides for weed control. I'll put it as plainly as I can; one of the best ways to manage a glyphosate-resistant weed population after you have discovered it is to apply a preemergence residual herbicide at or near soybean planting. Make sure the preemergence residual herbicide you choose is effective on your weed in question, and if so you will see a dramatic reduction in the number of glyphosate-resistant weeds that ever get exposed to a postemergence application of glyphosate. In the case of glyphosate-resistant waterhemp, we have shown in several presentations and publications (http://extension.missouri.edu/publications/DisplayPub.aspx?P=IPM1030) that applying a preemergence residual herbicide is a much more effective way of dealing with this weed than trying to control it with a postemergence tank-mix partner. In some instances we reduced the glyphosate-resistant waterhemp population by 97% with a preemergence herbicide application when compared to the waterhemp population that existed at the time of the postemergence tank-mix application. In the case of glyphosate-resistant giant ragweed, there are fewer preemergence residual herbicides that are effective on this species, but preemergence herbicides with good activity on giant ragweed like Gangster, FirstRate, Boundary, and Authority First can still reduce the population of this weed dramatically. If there is some of the resistant weed population that escapes the preemergence herbicide application (and there usually will be), then it is still a good idea to apply an alternative herbicide as a postemergence tank-mix partner with glyphosate. Assuming that these weeds aren't resistant to PPO-inhibiting herbicides, some of the products that have good activity on both glyphosate-resistant giant ragweed and waterhemp include Cobra and Flexstar. FirstRate also has good activity on giant ragweed, assuming the population is not resistant to the ALS-inhibiting herbicides. Figure 1. Influence of preemergence herbicide treatments on grass and broadleaf weed density at the time of the postemergence glyphosate application (2007-2009). If you do not have herbicideresistant weeds as a problem or concern in your fields and you are trying to decide which preemergence residual herbicide might be best for you, I think there are two primary factors to consider. The first is obviously price. The products shown in Figure 1 range in price from about $9 to about $15 per acre, so the product you choose can have a big impact on net income. The second consideration is whether the preemergence residual herbicide you choose will match the spectrum of weeds that you have in your field. 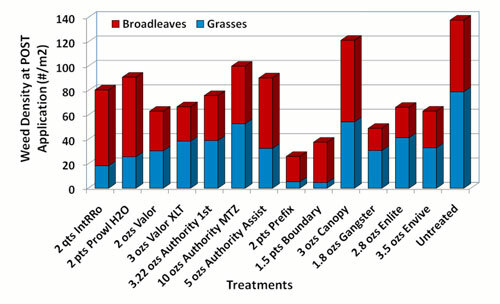 As illustrated in Figure 1, many of the preemergence residual herbicides available provide good suppression and/or control of broadleaf weeds, but little control of grass weeds. If you have heavy grass weed pressure, you may need a product that provides suppression of both grass and broadleaf weeds prior to the planned postemergence glyphosate application. Another thing that the results in Figure 1 illustrate is that few, if any, of the preemergence residual herbicides applied at these "foundation rates" provide season-long control of the ommon weeds we encounter in soybean production systems in Missouri. Keep in mind that the results shown in this figure are the combined results from an experiment conducted for the past three growing seasons. These foundation rates are designed to buy you time and eliminate the need for the first pass of glyphosate in a traditional 2-pass glyphosate program. Our research indicates that following these preemergence residual herbicide treatments with a postemergence glyphosate treatment will provide excellent season-long weed control and optimize soybean yields.